Toast all spices and chilies in a dry sauté pan over medium heat until fragrant and toasty. Toast turmeric and shallots in a separate dry sauté pan over medium heat until you start to see slight browning. 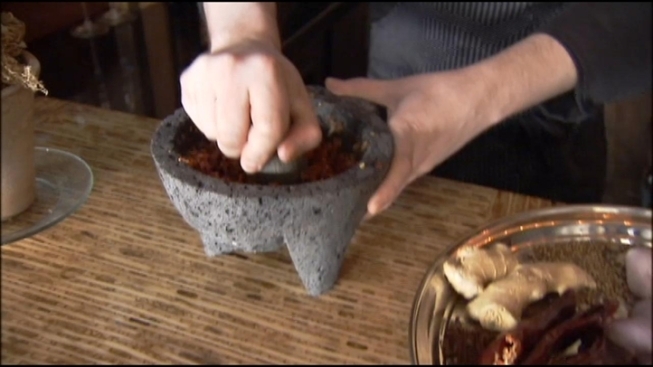 At the restaurant, we pound all of the paste ingredients in a rock mortar and pestle until it’s a smooth paste, this is a long time consuming process, we enjoy the flavor this way and feel it’s more developed. In sake of saving time you can use a blender. Once your paste is made you can start making the soup. Add 1 cup of thick coconut cream (this is not the same as coconut milk) cook this over low/medium heat until you start to see it separating. You will see a bit of grease forming on the top. You will then add the paste to this separated cream (this process is called cracking the cream). You will use the grease from the separated cream to fry the paste until fragrant and aromatic, be careful not to burn it. Then we add the chicken thighs and fry them in the paste and coconut cream just until they start to brown. After you have browned the chicken thighs we add the remaining half cup of coconut cream and 3 cups of chicken broth. Stir to mix. Let simmer until chicken thighs are cooked through. Season the broth to taste with fish sauce and a touch of palm sugar. With a large pot of boiling water boil the fresh noodles until the noodles are cooked. Strain the noodles into two large bowls.Top off with chicken thighs and the Khao Soi broth. Garnish with chopped cilantro.